Navy and Marine Corps divers have recovered the bodies of all 10 sailors who went missing last week after the USS McCain and an oil tanker collided off the coast of Singapore, the U.S. Navy said Monday, per USA Today. 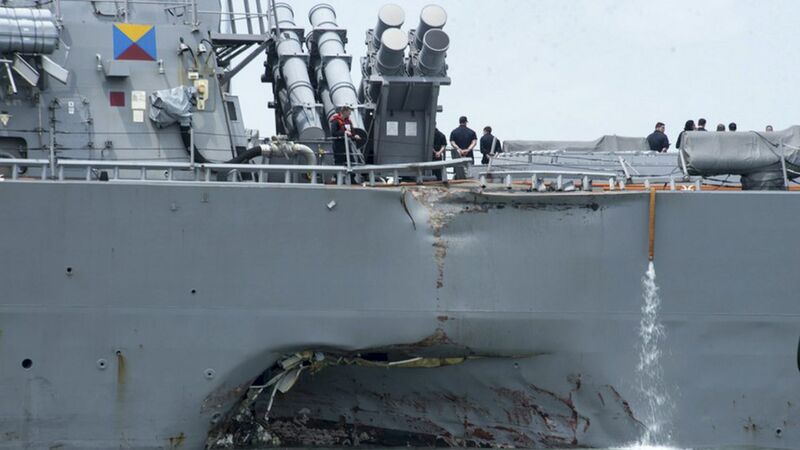 Following the August 21 collision, the commander of the Navy's Pacific Fleet was fired after a string of deadly mishaps this year. The fleet's Vice Adm. Joseph Aucoin, a three-star admiral, was also fired in what USA Today describes as "a rare dismissal of a high-ranking officer for operational reasons." What's next: The Navy has ordered an operational pause on all fleets worldwide, and the Japan-based 7th Fleet will also conduct a full review of its vessels. The victims, who range in age from 20-39. • Charles Nathan Findley, 31, Electronics Technician 1st Class, from Amazonia, Mo. • Kevin Sayer Bushell, 26, Electronics Technician 2nd Class, from Gaithersburg, Md. • Timothy Thomas Eckels Jr., 23, Information Systems Technician 2nd Class, from Manchester, Md. • Corey George Ingram, 28, Information Systems Technician 2nd Class, from Poughkeepsie, N.Y.
• Dustin Louis Doyon, 26, Electronics Technician 3rd Class, from Suffield, Conn.
• Logan Stephen Palmer, 23, Interior Communications Electrician 3rd Class, from Decatur, Ill.
• Kenneth Aaron Smith, 22, Electronics Technician 3rd Class, from Cherry Hill, N.J.